We have a whale of a tale to tell you! Whale actually, we just want to tell you about our HUMPACS presentation at Whale Tales. 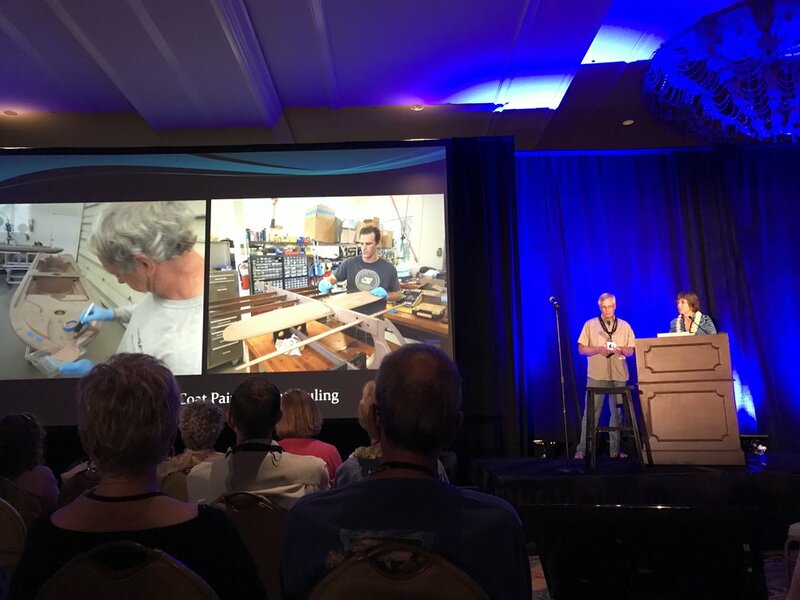 Every year since 2016, whale lovers from around the world gather at the Whale Tales event on Maui. Hosted by Whale Trust (our HUMPACS partner), this event allows world-renowned scientists, photographers, filmmakers, and conservationists to share and discuss their work and latest research with the public through captivating talks, receptions, and exciting whale watches. This year’s presenters were terrific. On February 16th, our HUMPACS project manager and VP of Hawaii Operations, Beth Goodwin, flew over to Maui to present our HUMPACS project with Dr. Jim Darling (Image 1). Beth has given talks at Whale Tales a couple of times within the past few years on JRF Wave Gliders and her humpback research. We are honored to participate in this memorable event, and it’s a great way to impart current scientific discoveries and research to the public. Image 1. Beth Goodwin and Dr. Jim Darling presenting HUMPACS. The slide consists of our team members, Murray (left), and Adam (right), assembling Europa. In the U.S, a significant gap in opinion exists between the general public and scientists on a wide range of science-related topics. The difference is partly due to the lack of STEM education in grades K-12, which creates a population that is scientifically illiterate. Science can be hard to understand if one is not familiar with the scientific method and the language scientists use, thus resulting in mistrust and misunderstanding of scientific data. Therefore, communicating scientific matters to the public can be a challenge. Whale Tales is an event that contributes to bridging this gap because presenters convey their research via engaging media presentations, storytelling (tales), and discussions from which the public can gain knowledge that’s been modified to be intelligible. Additionally, the event creates a way for scientists to present their work to their colleagues and professional peers. This allows the scientists (and other presenters) to receive feedback on their research and engage in discussion, which enables them to improve their work. After her presentation, Beth, and Dr. John Ford volunteered to be naturalists on one of the whale watches where they were able to share their knowledge about humpback flukes and photo identification (Video 1). It’s not a fluke that they saw so many whales! Humpback whales have unique pigment patterns on their flukes (tails). Researchers compare fluke pictures to identify individuals. In 2007, Cascadia Research completed the SPLASH Project, which compiled thousands of fluke photos from numerous researchers with the purpose of determining population size within the entire North Pacific basin. In other news, On Feb 19th, Europa made her way to the first seamount! 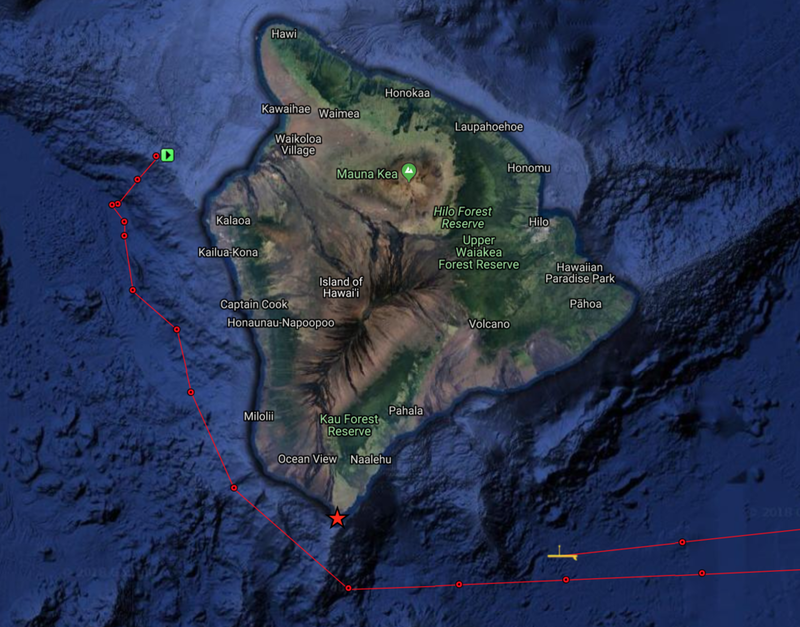 Once there, we had her swim in a circle around the seamount for a few days while we listened to audio snippets. We’ve heard some unusual noises, but nothing that confirms the presence of humpback whales. So, we will persist forward. 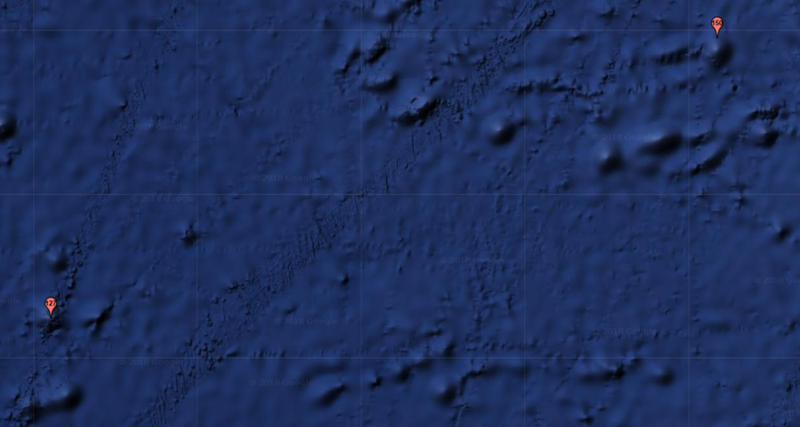 Our next target is a chain of seamounts within the outskirts of the Baja California Seamount Province (Image 2). It’s approximately 660 nautical miles away and will take about 18 days to arrive; between March 10th-13th. Image 2. 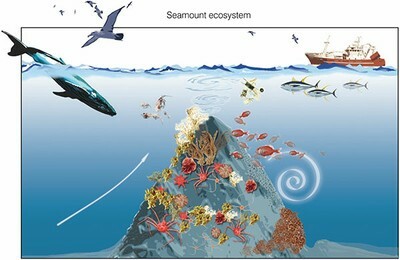 Our next target: a chain of seamounts. On Feb. 21st, Oceans Deeply interviewed Beth and wrote a compelling article about our mission. This media outlet is an excellent source for current ocean discoveries, and they’ve written numerous articles about Wave Gliders. Searching for humpback whale vocalizations in the middle of the Pacific Ocean is sort of like searching for a needle in a haystack. So, how do you search for a needle in a haystack? You build a sophisticated audio payload and keep your fingers crossed. Luckily our needle is a loud one! 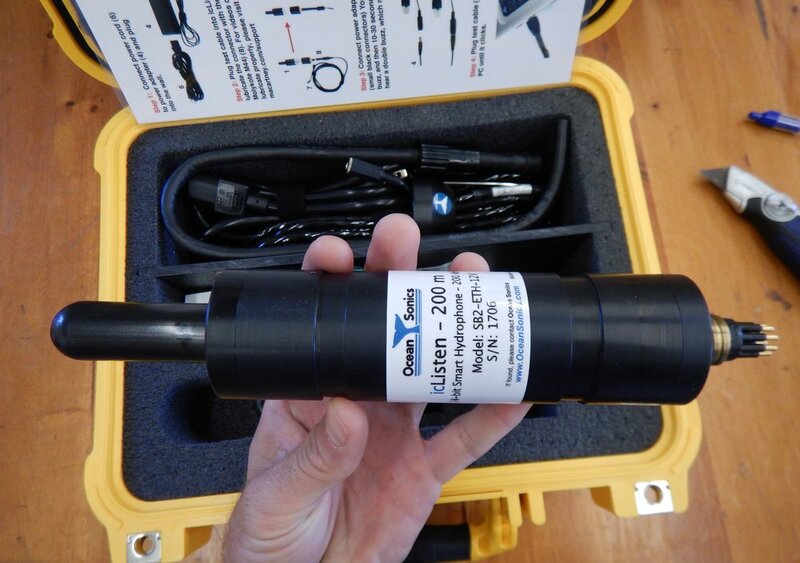 The construction of our acoustic payload required a lot of software and hardware engineering because we wanted our hydrophone to detect whales from miles away, and keep data from being lost in case of an accident. 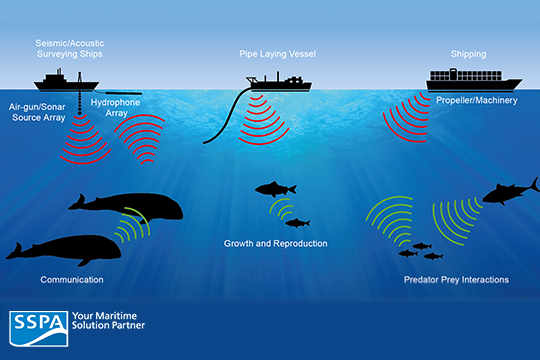 Consequently, we acquired a “smart” digital hydrophone (HP) called the Ocean Sonics icListen 200 kHz, which can record a wide range of frequencies and target most cetaceans (Image 1). 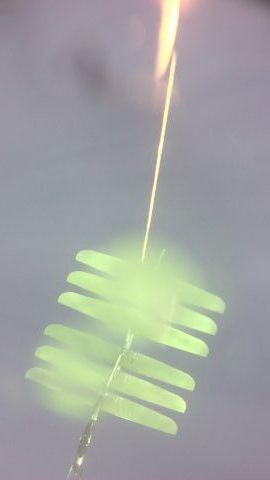 Many mishaps could occur to a dangling HP in the middle of the ocean, hence we attached the HP to Europa’s sub to ensure we wouldn’t lose it to entanglement or predation (Image 2). 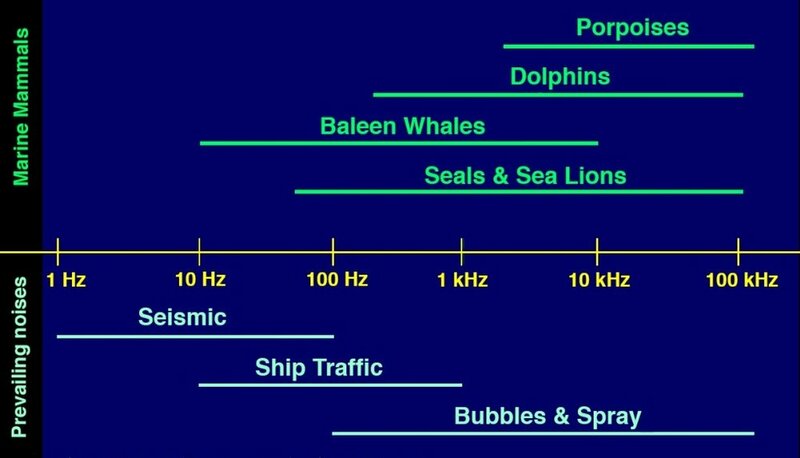 However, the self-noise of the sub is relatively loud, and we found that it interfered with the acoustic sampling. Therefore, we embarked on a design to decouple as much of the sub noise as possible and enlisted the help of an acoustician, Mike Holt, who has built similar devices his entire career. He helped us make a mount that would be durable but not too heavy, biofoul resistant for the several months mission and allow sound transference to occur. To construct this, we used a thick-walled 3” type K copper pipe, which is an excellent biofoul deterrent and provides mounting strength. 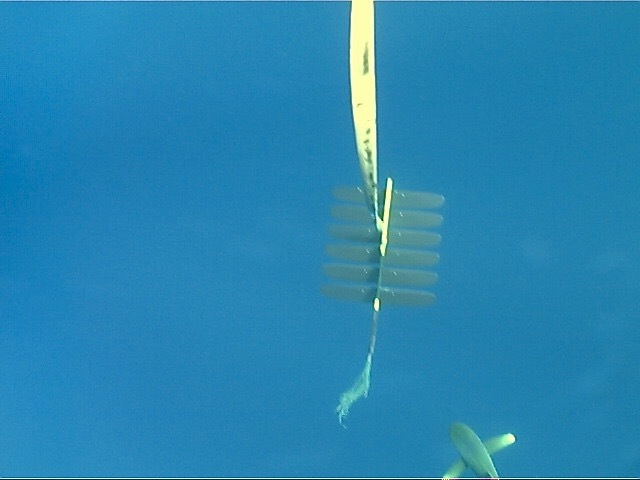 We mounted it to the center of the sub so that it did not add drag or change the pitch of the sub (Image 3). To mask the mechanical noise, Mike first designed an inner casing tube out of low-density polyethylene into which the HP would slide. To keep it from hitting the bottom or the sides we manually cut 15 donuts of 10 pores per inch by 0.75” thick polyurethane open cell foam to encase the HP. We then sealed the tube and filled it with medical grade castor oil, which is well matched to the impedance of seawater. After testing it for leaks, we slid the inner casing into the outer copper pipe modified with 250 drilled holes. The holes enabled the interference to be no greater than 12th lambda of the highest frequency of interest (Image 4). Overall, the entire process was painstaking but worth the effort to boost our chances of finding our needle in a haystack.